In this world there is technology and magic. It is your task to subdue the dragons, using any combination of technology and magic you so desire. To help you in your quest there are special armors that you can craft from the carcasses of the dragons you kill. You may also encounter villages with a questing shopkeeper and village lords that have special needs. Each have good rewards should you appease them. Go forth and conquer those Dragons! The initial concept of the pack that I have been steering it towards for 168 builds of it now is that it is supposed to have the feeling of World of Warcraft when you reach level 80, you have Epic gear and it's still not enough to take on the instance boss, so you go back to town and organize a party to go back and take on the boss. The dragons themselves represent the pre-level 80 bosses that you have form a single party for defeating them and then you fight over who gets the loot from it. Eventually there will be epic bosses added to the pack that will require more than one party to defeat. There are a couple public servers already included in the Multiplayer section of the pack. Simply click "multiplayer" and join one. If you are a streamer or a Let's Play series videographer, let me know on my discord or in the comments below. I need to know which version of the pack you are using so that I don't archive and make it disappear from you and your friends later on in the history of things. However, I archive things because they are inherently broken and I don't want you using them. Also, I will feature you on this page! This project is proudly powered by FORGE, without whom it would not be possible. Help Forge get rid of Adfocus by contributing at https://www.patreon.com/LexManos. Estou tendo um problema ao baixar o modpack, da um erro num arquivo de .zip o audio craft. Como resolve? 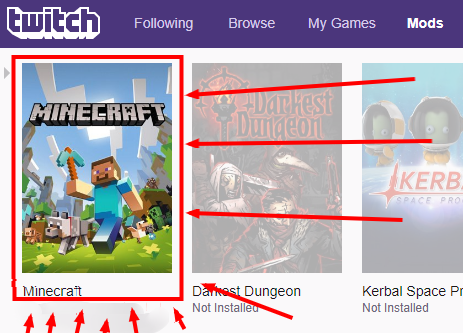 Procurando por um modpack no Twitch App? Acabou de lançar um modpack e quer ter certeza de que ele está aparecendo no aplicativo? Não tem problema, é fácil! 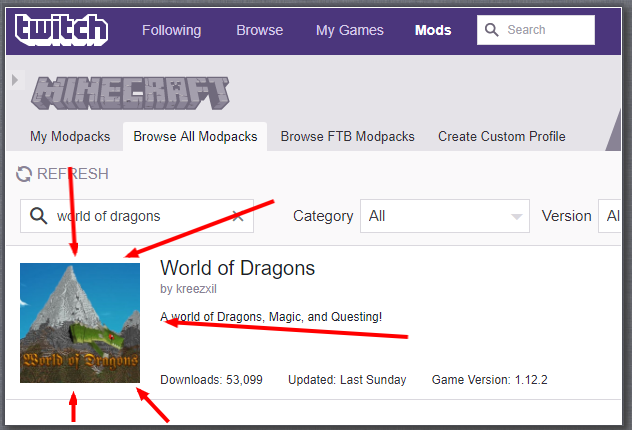 Este artigo é um tutorial geral sobre como encontrar e instalar um modpack no Twitch App, mas lembre-se de que o CurseForge foi criado para Autores, portanto, algumas terminologias podem ser direcionadas a esses usuários. Com o Twitch Desktop aberto, clique no cabeçalho "mods". Agora você precisa escolher a segunda guia da esquerda. 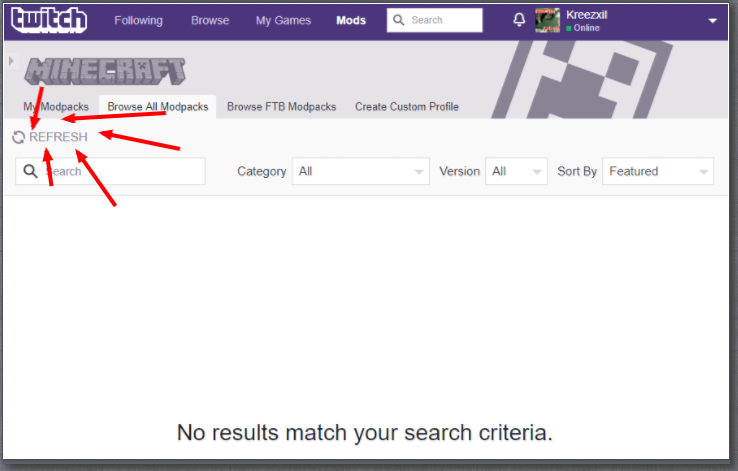 Em inglês é chamado "Browse All Modpacks"
Por causa de um bug no TwitchApp, nada será listado por padrão e a mensagem na parte inferior piscará a uma velocidade insana. 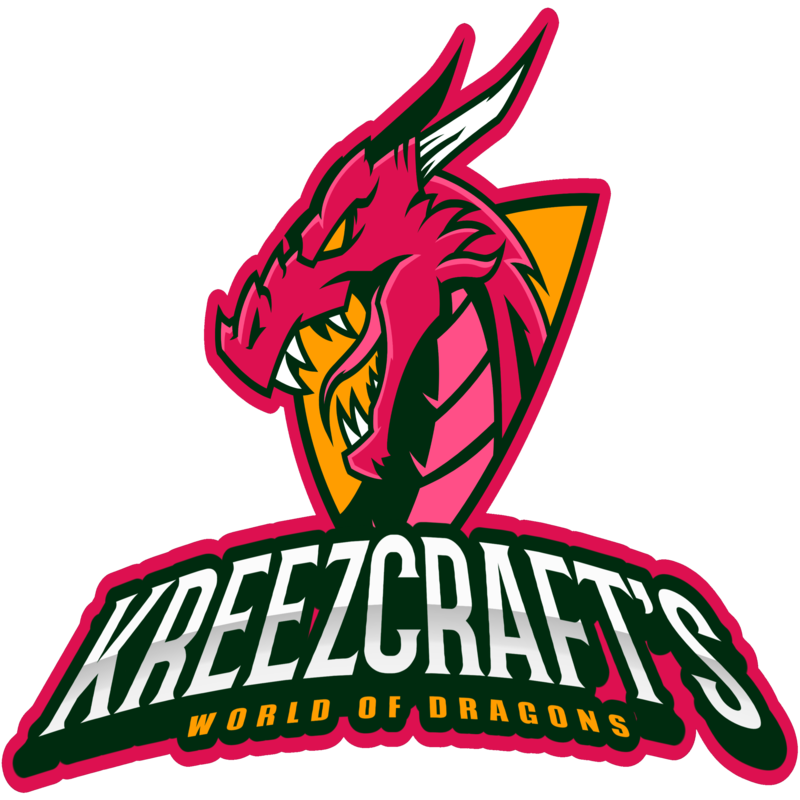 Na caixa de pesquisa, digite "World of Dragons"
Em seguida, clique no ícone "World of Dragons" para instalar o pacote. Depois que o pacote estiver instalado, clique nele para reproduzir. 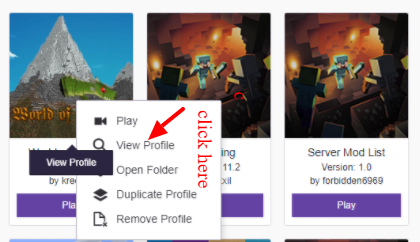 Se esta é a primeira vez que você instalou qualquer pacote Minecraft via TwitchApp, quando o lançador aparece, feche-o e clique no ícone do pacote novamente, esta segunda vez irá instalar o código Forge que realmente permite que o pacote seja executado. A partir desse ponto, qualquer pacote que você instalar funcionará diretamente da caixa. Esse é o problema, não termina de baixar, no app ta Twitch, não termina tem 103 mods chega no último mod o Audio Craft 1.5 da erro e o app exclui tudo e não da pra eu jogar, como resolve isso? Obrigado por este relatório. Eu vou ter uma correção do pacote em um par de horas! Você é o melhor! I have a problem, when I installed twitch and this modpack I wanted to start playing, but when I start play I have maybe...5 fps? It was horrible and there is my question... I used a 32 bit Java, so I said to myself, that this is probably the problem, so I installed 64 bit Java...but, when I wanted start playing, a 1.6.81 launcher appeared and when i click to PLAY it kicked me out and reported an error (something with Java). So I uninstalled 64 bit and re-installed 32 bit. It's worked, but again just with few fps. Do you have any advice how can I fix it ? Because with this fps I can't play. I hope you understand my question by the way. You have to open the profile by right clicking the icon and choose view profile. Then on the next screen in the upper right, click the 3 dots button "..." and choose "profile options". On the popup, unlock system settings and slide the slider to either 3.5 gb or more if you can spare it. Hit ok, and start the pack. Profil je třeba otevřít kliknutím pravým tlačítkem myši na ikonu a výběrem profilu. Pak na další obrazovce v pravém horním rohu klepněte na tlačítko se třemi tečkami "..." a zvolte "možnosti profilu". V rozbalovací nabídce odemkněte nastavení systému a posuňte posuvník na 3,5 gb nebo více, pokud jej ušetříte. Stiskněte ok a spusťte balíček. First, do not add anything to the pack. Second, just in case, here are screen shots of what you need to do. Move the memory slider as far to the right as you feel comfortable. I have a 32GB systems so I moved it all the way to the right. The minimum to run the pack is 3.5GB, 6 to 8GB is a good average. 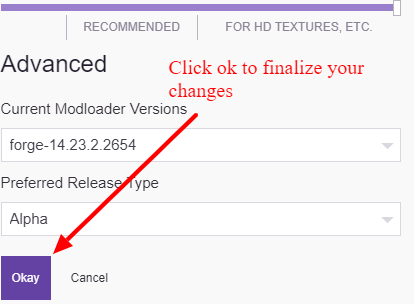 remember to click ok to finalize the changes and then start the pack. You can get the log by going to the the 3 dots button and clicking "open folder" then open the "logs" folder. Open "latest.log" in a text editor and hit ctrl+a to select all of it, then ctrl+c to copy it to the buffer, and at pastebin.com, clicking in the paste box and hit ctrl+v to place the buffer into the box. Hit submit and the URL (address) will change, give me that new url. I have two Czech speaking staff on my Discord, please join it and continue your support queue there. Thank you. I have a small problem, which gets a little annoying, and I don't know how to fix it. Every time I load up the launcher, the RAM goes to the default allocation setting. It lags a lot, so I have to quit the game, load the launcher, change the RAM setting, wait for the game to load again, and then play. Is there anyway to set 6GB as the default RAM allocation? the problem you describe is not suppose to happen. when you custom set the ram it is suppose to stay up high or where ever you set it. the only way I can see you having an issue is that you are not using TwitchApp or MultiMC but instead some other launcher. That's a little concerning. 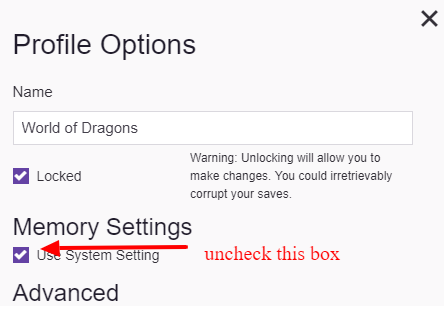 I just thought it was a setting I had to use in the TwitchApp, so I'll look into it. Thanks for your help! sure thing and in the future join my discord server and ask for the @staff in the appropriate channel. Someone there may have experienced the problem already. Probably not this one tho. Upon looking into your problem further, for the TwitchApp, open the main sprocket, ie the master settings. Go to Minecraft, go down to where the memory and screen size are set. Change those default values there. You probably have set to a minimum value vs not set all such as in most cases. That's why it keeps reverting. Either unset everyting there or set it to your new permanent desires. That is a problem but it doesn't tell me anything. 2. I need the full crash report, which is located where the pack is installed, this is easy to find. 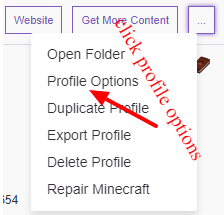 In twitch app, for the pack profile, click the drop down, click "view profile", on the next page click the 3 dots button "..." and click open folder. You will see a crash reports folder, open it and then open the crash report that is there, copy all of it and put that on pastebin.com and send me the url. 3. I'll have a pack update out before Mar 31 that will likely solve your inadequately described error. My game keeps on crashing when I try to load the mod. Any ideas why?